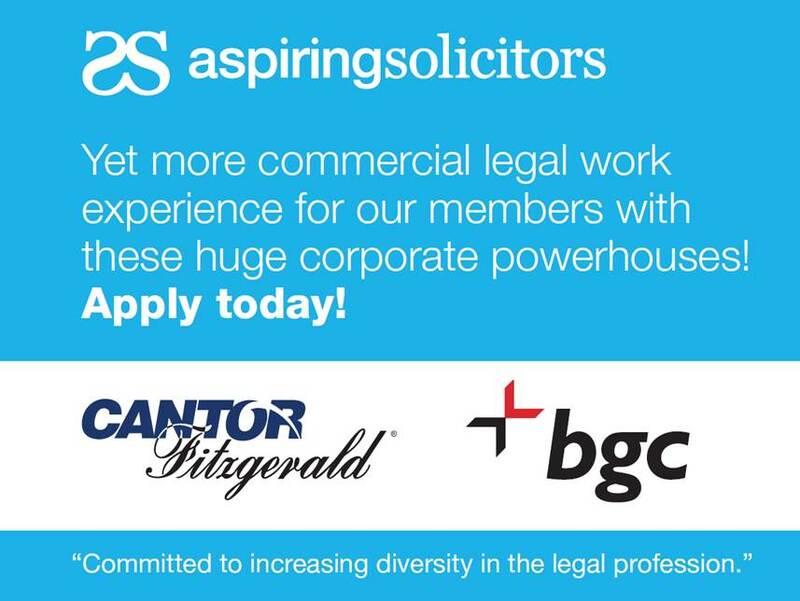 We are pleased to announce the establishment of the BGC Partners & Cantor Fitzgerald Experience Law Initiative (ELI) which will offer paid legal work experience placements to qualifying candidates from underrepresented backgrounds, in partnership with Aspiring Solicitors. The ELI opportunity will provide the successful Aspiring Solicitors members with insight into an in-house legal working environment. They will assist the groups’ Legal Department during a week-long programme (bespoke to the selected candidates between September and December) and will also benefit from a range of business focused experiences. The aim throughout will be the building of confidence and development of key skills including commercial awareness, strategic thinking, research, negotiation, presentation, personal impact and team working. Exceptional candidates will have the opportunity to be considered for a training contract. General Counsel, James Lightbourne, leads the Europe, Middle East, Africa and Asia-Pacific Legal Department which supports and provides strategic advice on the full spectrum of the groups’ activities including international M & A, corporate finance, general corporate/commercial matters, employment, partnership, regulatory/compliance matters and real estate. The team’s lawyers run the majority of deals, global projects and litigation in-house. committed to a career in law and able to demonstrate exceptional performance to date in ways including academic achievement, pro bono work/volunteering, sporting achievements or balancing legal studies with work or care for dependants. The ELI opportunity is not open to any individuals who have already accepted a training contract with any law firm or in-house legal team. Please click the “Apply now” button at the top of this website. Deadline is 9 am on 30 July 2018. We may consider applications on a rolling basis and we reserve the right to close applications early should spaces be filled. No late applications will be accepted. This is a paid work experience programme (subject to contract) and will be based at the groups’ offices in Canary Wharf. There may be visits to court or other sites in London. Please note that this is a week-long placement and will take place between September and December. It is not a four month placement. BGC Partners is a pioneering global brokerage group headquartered in London and New York and servicing the financial and real estate markets. BGC’s Financial Services offerings include fixed income securities, interest rate swaps, foreign exchange, equities, equity derivatives, credit derivatives, commodities, futures, and structured products. Find more information at www.bgcpartners.com. Cantor Fitzgerald is one of the world’s leading financial services groups. It pioneered computer-based bond trading, built one of the broadest distribution networks in the industry and became the market’s premier dealer of government securities. It specialises in equities, investment banking, real estate, fixed income products, currencies and prime services. Find more information at www.cantor.com. Please detail any mitigating circumstances you would like us to consider with your application (200 words max). If you have none, please state "Not applicable"
Please confirm you have read and understood the eligibility criteria above for the BGC Partners and Cantor Fitzgerald Legal Work Experience 2018/19. Please upload your CV. In order to progress your application, your CV must contain a percentage breakdown of all modules on undergraduate and postgraduate (if applicable) courses, if applicable. Use the link above to upload your CV.